This weekend my bf and I went for an after-dinner date to Cottage Bistro. This small bistro, located in a busy bistro/cafe filled Main Street, sits around 50-60 people, serves a one page menu of appetizers and entrees mixed with Western and Chinese dishes. The Saturday evening we went, it was beginning to get busy around 8pm. There was a live band playing that evening resulting in a $5 cover charge per person. A friend of ours plays in the band called X Ray Ted, playing cover songs ranging from rock oldies to blues/funk to bluegrass. 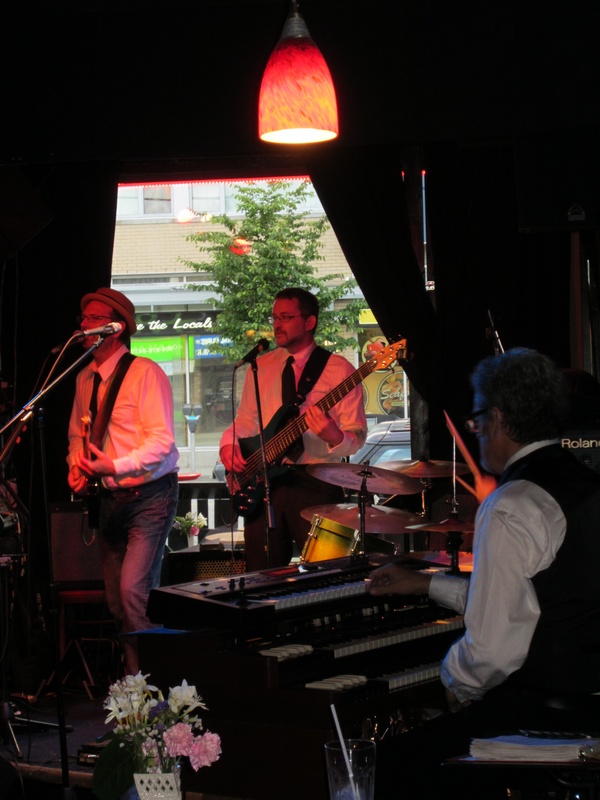 We heard songs from The Doors, James Brown, and even Ace of Base! The band got the crowd dancing on the small space in front of the stage. We were happy to support this group of talented musicians, playing for the fun of the crowd and dressing up in odd reggae-styled costumes near the end of the night to lighten the mood. As for the food and drinks, my bf and I, along with some of his friends who joined us, ordered mostly dessert and drinks. The highlight dessert of the evening was Cottage Bistro’s signature dish – Malibu-nana. This dish consisted of pan-fried bananas cooked in a brown sugar and coconut rum sauce, accompanied by two scoops of vanilla and chocolate ice cream. 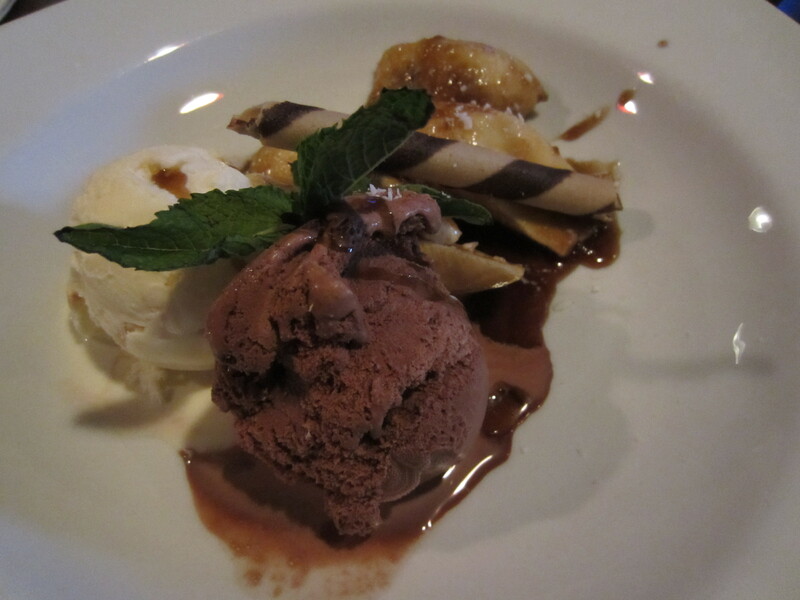 This dish was sinfully delicious – the ice cream complimenting the sweet banana and brown sugar/coconut rum sauce. I found it just a tad too sweet if you ate it without the ice cream. I also didn’t really taste the coconut rum part. 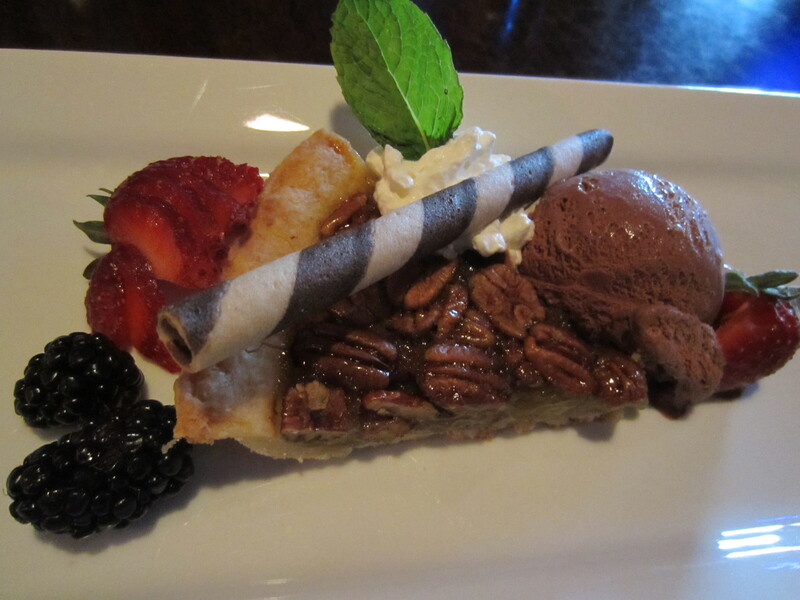 My bf ordered the Pecan Pie with Ice Cream, which came with whip cream and a scoop of chocolate ice cream. It was suppose to come with an espresso drizzle on the pie, however we did not taste the espresso on it. The strawberry and blackberries to garnish the pie was the perfect touch to the dessert. Would have loved to try their Chocolate Mud-Pie, however they were out of it that evening that we went. Another friend of ours ordered the New York Cheesecake. which came with chocolate and berry coulis, and some strawberries and blackberries to garnish. Not too heavy and a decent size for this cheesecake, although nothing particularly special. Their menu also showcased nightly drink specials. Saturday night drink specials included $5.35 1516 pints and $6.95 double bombay sapphire gin. The only issue I had was the lack in offering of glasses of wine on the menu – only their house red and white are offered by the glass, the rest of the menu of wines were bottle only. Looking around the packed room at around 9-10pm, the audience at Cottage Bistro was predominantly mid-30s to 50s, most people ordering beers and bottles of wine. By 11:30pm, a few stragglers looking for a place for a late night bite came in ordering burgers and fries. Mental note to try their burgers and fries next time as they looked really delicious. Being owned by Asians, I’m sure their Asian dishes are up to par as well, although I didn’t see many people ordering those dishes. Cottage Bistro provides an intimate setting with some quieter tables in the back. Reminds me of a less-pretentious Capone’s with some wonderful service by its owner and servers. No one’s rushing to ask you to pay your bills, and the servers come around several times in the evening to take drink and food orders. 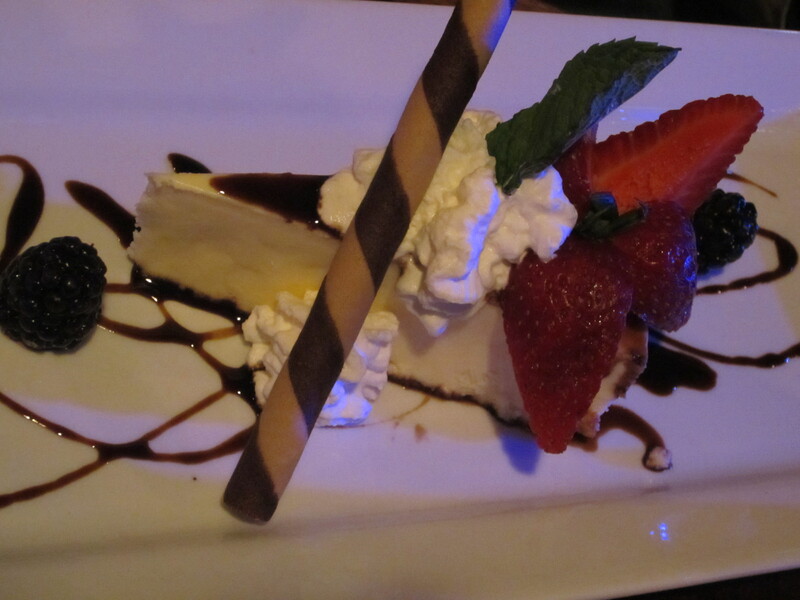 For those looking for a nice evening out – check out Cottage Bistro for their local live music and desserts!